Portable Aluminum Load Lifter is durable, lightweight, and constructed of corrosion resistant aluminum. 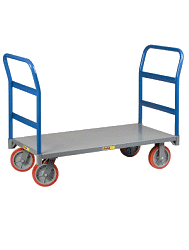 Ideal in shipping and receiving areas to load and unload pallet racking and to move parts. This unit folds up and down for compact storage and easy transportation. Ultra low profile design with ramp is great for appliance, office, and furniture stores. Uniform capacity is 200 lbs. Breaks Down for easy storage in tight places and for transportation in the back of a vehicle. Service Range 1" to 61"